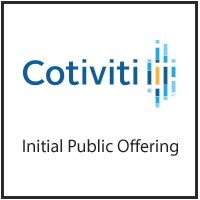 When considering different investment banks to help with the IPO of Cotiviti Holdings, a provider of analytics-driven payment accuracy solutions for the Healthcare sector, Advent International selected Baird among the underwriters. The private equity firm and Company management had developed a long-standing relationship with Baird and valued the firm’s strong Healthcare equity research coverage. They were also attracted to Baird’s respected Healthcare IT (HCIT) M&A practice – something that may be helpful down the road if the Company were to pursue an M&A strategy. Baird’s HCIT Equity Capital Markets team played an active role in marketing the IPO, attracting tremendous interest from institutional investors. The end result: the stock priced at the high end of its initial filing rage and had an institutional order book that was over-subscribed by eight times. Today, the stock is currently trading 50% above its offer price.